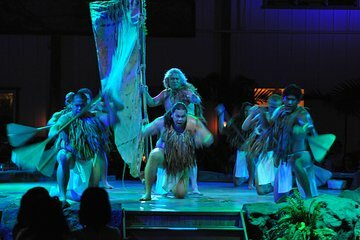 Luau Kalamaku foi eleito o "Melhor Show Luau" em Kauai pela Lonely Planet. Para começar sua divertida noite, vá até a histórica Kilohana Plantation ou escolha uma opção que inclua a coleta no hotel. Faça um upgrade para fazer um passeio ao redor da propriedade de 104 acres (42 hectares) na Kauai Plantation Railway antes do jantar. Desfrute dos exuberantes jardins tropicais enquanto observa os tradicionais artesanatos havaianos e experimente a sua diversão em alguns divertidos jogos na ilha. Se uma opção de jantar for selecionada, a festa começa com a iluminação da tocha e uma cerimônia de imu havaiano, na qual um porco assado inteiro é retirado de um forno subterrâneo. Mergulhe em um bufê abundante de pratos favoritos da ilha, incluindo mahi mahi, frango teriyaki, salmão lomi lomi e uma variedade de verduras locais, frutas frescas e acompanhamentos. Junte-se a outros hóspedes enquanto janta e complete sua refeição com uma deliciosa bebida tropical no bar (por conta do visitante). Com o seu apetite satisfeito, dirija-se ao Pavilhão Luau para um espetáculo inesquecível que conta a história dos primeiros exploradores taitianos que pousam nas costas havaianas. Assista aos truques fascinantes dos twirlers de chamas, além da graciosa coreografia de dançarinos polinésios vestindo trajes tradicionais. Música ao vivo acompanha o show, incluindo a poderosa bateria em instrumentos feitos à mão pelos músicos. Após o show, você terá a chance de conhecer os artistas e tirar fotos antes de voltar para a noite quente havaiana. Se o seu hotel não estiver listado nesta lista de coletas de hotel, isso não significa necessariamente que o transporte não seja fornecido a partir daquele local. Esta lista deve ser usada como referência. Excellent show! Loved it! The food was a bit to be desired, but the chicken was great! I loved the vendors in the beginning, however, wished they had stayed before the big show. Wanted to purchase more. Grounds are beautiful. Wait staff great! Tour bus transportation very nice, COLD air. Bring a sweater. I would recommend this to all! The Luau Kalamaku was delightful! We enjoyed the atmosphere, music, show, and delicious Hawaiian cuisine. Women received Leis and men received shell necklaces. Photos were taken with the option to buy them which we did. The staff was friendly and the buffet line was organized and we went through quickly. We took the train tour of the grounds and saw animals, trees, plants and vegetation. Not sure we'd do the train tour again, but it was pleasant. The show was exciting with professional dancers. We could hear everything well. I recommend this Luau! The train ride and performance were lots of fun. Train ride was the highlight. The food and drinks on the other hand left much to be desired. The setting is very good and a lot of fun. Meal was great and the entertainment perfect. A good value. We really enjoyed the Luau at Kalamaku. They whole process is very smooth. When you first arrive you take pictures that you can purchase later for 25. No pressure is given. Then you can enjoy cocktails while you shop at various arts and craft vendors lining the beautiful grounds or you can sit and relax at your table. The show is a beautiful production that is well executed. We were so impressed by the dancers and the love they obviously have for their craft. Their smiles never left their faces!!! The food was ok, nothing we would rave about but the pork was good. Overall, an excellent Hawaiian experience not to be missed. We did the Luau and train ride. We had a great time. The train ride was fun and the entertainment at the Luau exceeded our expectations. We loved that it was a story. Unfortunately, the food let it down. There were 4 of us--2 picky eaters and 2 with adventurous palates. None of us liked the food. We appreciated the traditional food offered, but for those of us who did not enjoy it, a few options of simple foods would have been appreciated. Buffet dinner was great. Plenty of food with a lot of variety. The show was fantastic. The dancers were great and told a wonderful story. The singers were amazing, very talented. Whole staff was very friendly and helpful. Only issue we had was with the transportation. We had to walk to another hotel at least 4 blocks away because we were told we could not park there and must walk. Coming back was dark and raining. Not a pleasant end to a wonderful evening. Luau Kalamaku was the BEST luau I've ever attended. 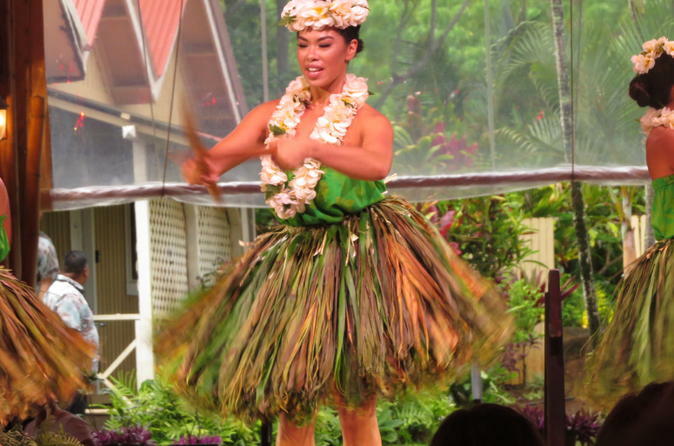 Free drinks, great pork and fixings, and the story in dance of Polynesians arriving in Hawaii. The costumes, the orchestra, the dancing were all outstanding! It was sooo much more than just a hula. Also, the bus ride from north Kauai to the south was only 14 extra! Really a great bargain!! I've been to luaus before, but this luau was great. Food was delicious and entertaining was very good. My one complaint would be that the story line was a little too long. People were getting anxious sitting there. I would suggest shortening it a bit.